The city of Sogamoso is certainly not going to win any beauty contests. It does, however, make a great base for travelers who want to visit one of the few wineries in Colombia, check out a museum devoted to the country’s Muisca culture, tour Andean villages, and admire Lake Tota (Laguna de la Tota in Spanish). The highest and largest lake in Colombia is a stunner despite the environmental battle that’s raging around it. 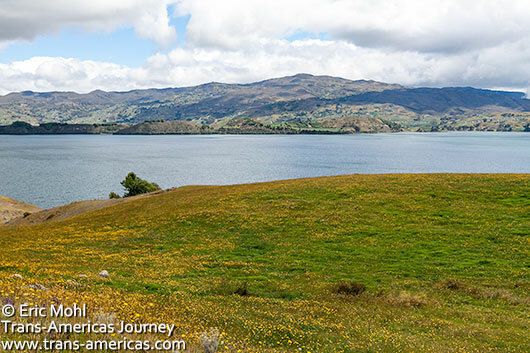 Lake Tota is the highest and largest lake in Colombia. It’s also facing serious environmental challenges. 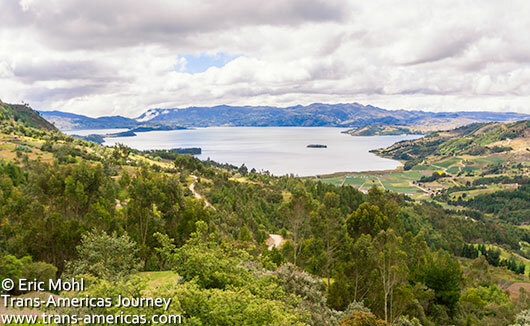 We don’t know about you but we’d never seen a mountain lake with a white sand beach before we arrived on the shores of Lake Tota in the Andes above Sogamoso. At 9,891 feet (3,015 meters) and covering 21 square miles (55 square km), it’s the highest and largest natural lake in Colombia and the second highest navigable lake in South America (after Lake Titikaka in Peru and Bolivia). It’s also very, very beautiful and that’s part of the problem. 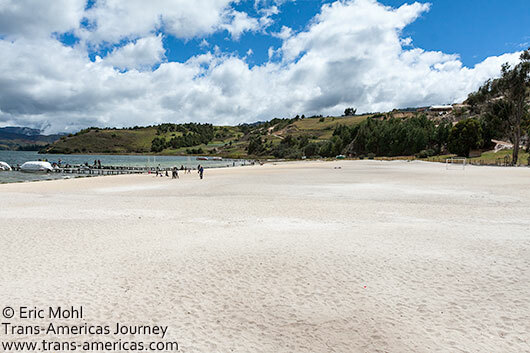 This sandy white beach surrounds part of Lake Tota in Colombia. The deep lake doesn’t look polluted. The water is clear, green reeds flourish around the edges and provide a haven for birds. The beach-like sandy shore is so white it’s called Playa Blanca (White Beach). Locals brave the cold, high altitude temperatures to take a dip and the lake supplies water for thousands of area residents. However, that water might not be safe to drink. Local conservationist Felipe Velasco says he wouldn’t touch the stuff. He’s been borderline obsessed with the water quality and general environmental well-being of the lake since 2009 when he unwittingly rented a plot of land he owns on the lake shore to a trout farmer. At that time he says he was unaware of the polluting effects of trout farming and when he became aware of the environmental impact of fish farming he tried to get out of the lease. Years late he was still trying to end the lease. Despite its beauty, Lake Tota is under serious environmental pressure. 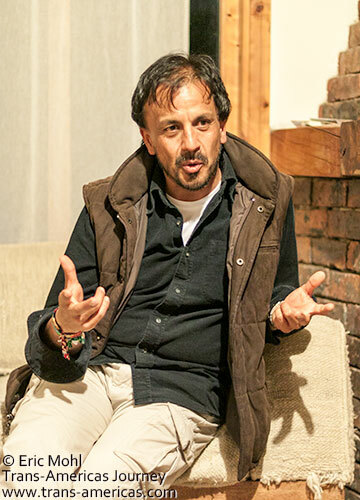 Since entering into the trout farm lease, Felipe has learned about other environmental threats to the lake and, in 2010, he formed Fundacion Montecito, a non-profit org focused on protecting Lake Tota and the area around it. Felipe Velasco is fighting to stop pollution in Lake Tota and the surrounding areas. One of the main polluting elements in the lake is trout farming. When we spoke to Felipe he said there were eight caged trout farms in Lake Tota producing millions of trout a year and resulting in concentrated organic pollution and pollution from fish food in the lake. In 2013 one million trout died from oxygen deprivation in Lake Tota, according to Felipe. Felipe believes local onion farmers are an even bigger threat than the trout farms. Farmers have been growing onions on the shores of the lake and nearby hillsides for decades. The majority of onions consumed in Colombia come from farms around the lake. There are so many onion farms that the place smelled like onions when we were there. An onion statue in the main plaza in Aquitania, the principal town on Lake Tota. Farms around Lake Tota produce most of the onions consumed in Colombia. It’s big business and an important part of life in the local communities. However when we spoke to Felipe he said that chemicals from pesticides and fertilizer used in the onion fields inevitably find their way into the lake, polluting the water even more. “I see the lake as a living body that can’t talk for itself,” Felipe told us. Over the years, Felipe and others have managed some environmental victories for Lake Tota including international recognition and some protections and the implementation of environmental education in local schools, but commercial scale fish farming and onion farming continue. 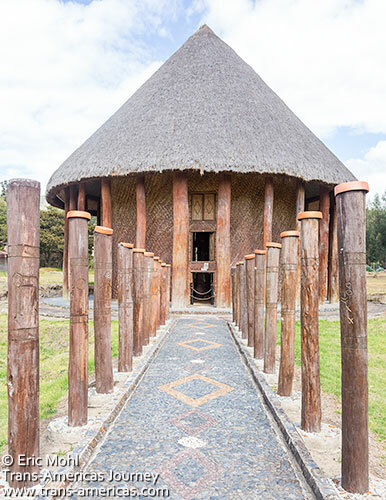 A recreation of the Temple of the sun at the Archeological Museum Elicer Silva Celis Suamox museum (often just referred to as the Temple of the Sun) in Sogamoso. The Archeological Museum Elicer Silva Celis Suamox (better known simply as the Temple of the Sun), on the outskirts of Sogamoso (6,000 COP/about US$2 per person, exhibits all in Spanish), is one of the few (some say the only) museums focused on the Muisca people. 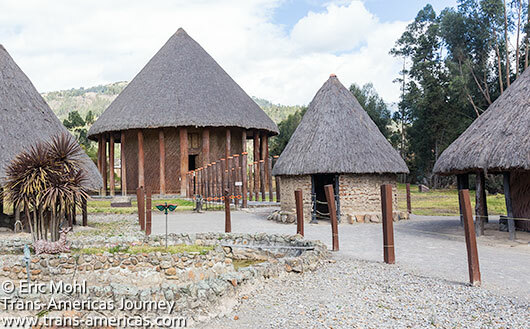 There are various rooms with displays of baskets, pottery, and other relics but the highlight, for us, was the chance to check out recreations of the culture’s elaborate round buildings including the Sun Temple which the Muisca used for religious ceremonies before it was destroyed by Spanish conquistadors in 1537. The Archeological Museum Elicer Silva Celis Suamox (aka the Temple of the Sun) in Sogamoso. Further out of town you will find one of the few wineries in Colombia. The Marquesa de Puntalarga winery manages to grow grapes and make a wide variety or wines at 8,400 feet (2,560 meters). We found most of the wines produced here to be too sweet for our taste, but we had to admire owner Marco Quijano’s success with grapes at this altitude. 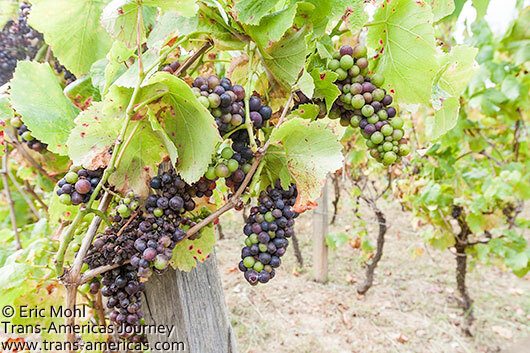 Grapes growing at 8,400 feet (2,560 meters) at the Marquesa de Puntalarga winery near Sogamoso. We heard persistent rumors (and even saw a flyer) about a brewery called 1516 in Sogamoso. However, the website doesn’t open and multiple emails to the owner went unanswered. If you find and visit 1516 brewery, please tell us all about it in the comments, below. 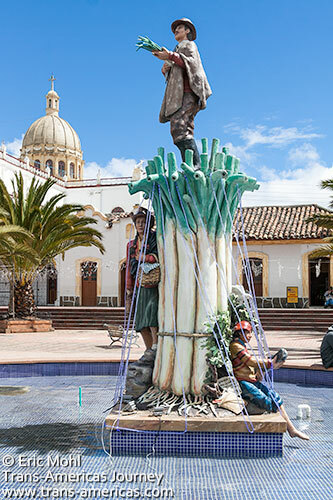 Sogamoso also makes a good base for visiting Andean villages including Mongui which is part of Colombia’s exclusive group of Pueblos Patrimonios. We toured many of the towns during Christmas when each village creates a nativity scene in the main plaza. Check out our Christmas in the Andes post to see more. 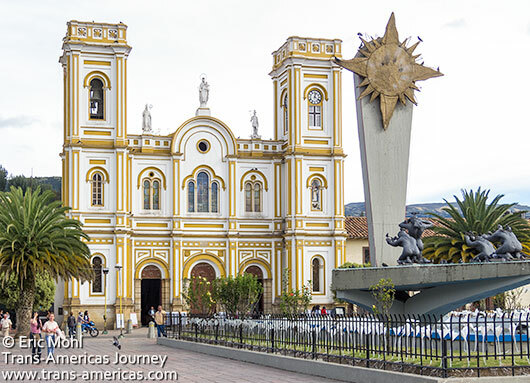 Sogamoso is not a beautiful city, but the main plaza and cathedral aren’t bad. It’s no contest: Finca San Pedro is the best place to stay in Sogamoso. Located a short distance out of the city itself, this economical and homey place is set in a large and tranquil garden. There are private rooms and a dorm and a shared kitchen. Yoga retreats are also offered. This is also a great place to learn more about Lake Tota. Felipe’s brother Juan runs Finca San Pedro and is very knowledgeable about the area and the issues affecting Lake Tota.